My 4 kids have always loved building and creating things, especially my youngest. Halloween has long been her favorite holiday. We get to build, paint and sew her costume (which then become part of the ever growing dress-up collection). This last year has seen her develop an obsession with snails. She builds homes for them, feeds them, etc. She even competes with her brothers to see how many she can stick on her face! 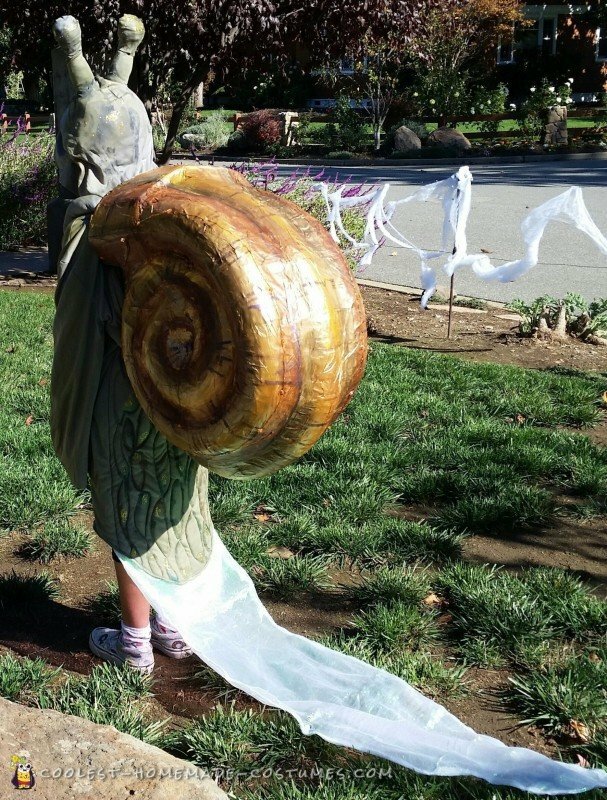 So I should not have been a bit surprised when she needed a snail Halloween costume. We scoured the local Goodwill for suitable green dresses for the snail’s body. We settled on an old “ghoul” costume that was a simple floor length shift on her (and it came with a hood & matching cape) I used some quilting batting plus a piece of the cape cut to match the inside of the back of the costume. Using the sewing machine I quilted the back of the costume. I wanted to create the rippling texture seen on a snails body. The bottom edge of the costume was rounded out to look like the end of a snail. My daughter then used fabric paint to add more dimension to the quilting in shimmery earthy browns greens and gold. I realized that during the day at school she would be unable to sit and work with the shell on. So we wanted the body to look like a fantastic slimy slug if she took the snail shell off. Finally, we took a length of shimmery white fabric. It was doubled over for strength and sewn to create wavy edges. At approximately 5ft long, it was the length of the snail body. It was attached to the underside of the bottom of the back of the snail costume. This was so that it would trail behind her as she walked recreating the look of a slimey shimmery snail trail. For ease of moving in large groups, I added press-studs to the underside. This way it could be folded up and shortened. The Snail head was created first by gluing two toy bowling pins to a toy dress up army helmet. (I bought all of these at the dollar store.) I glued a layer of quilting batting over the helmet and bowling pins to make them look smoother. Finally the antennae (bowling pins ) covered with fabric left over from the “ghoul” cape. Then two slits were cut into the hood on the snail body costume for the antennae. They were poked through and the hood was glued onto the helmet. 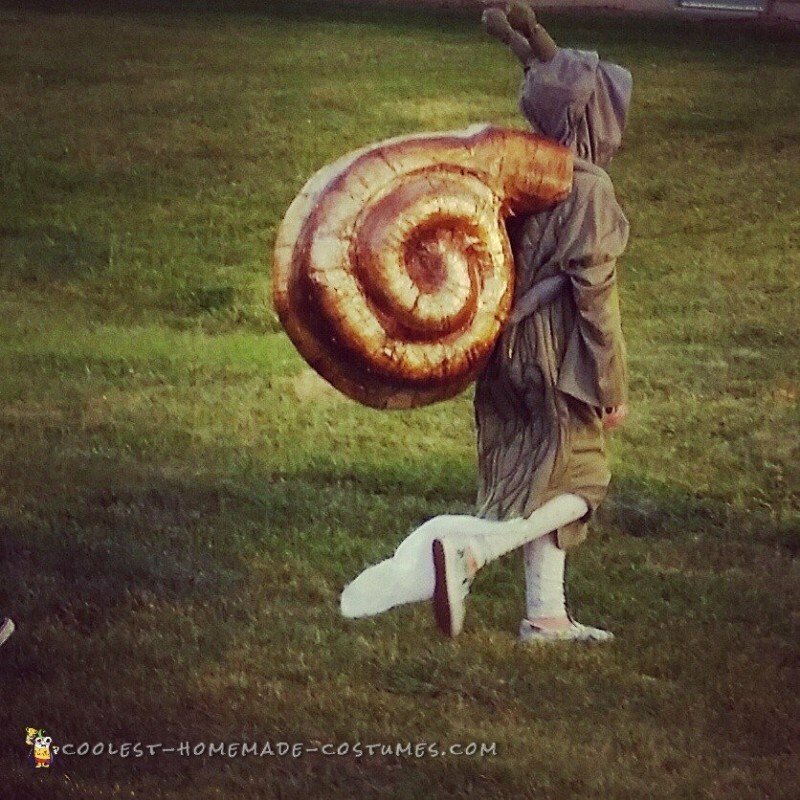 This made the snail head part of the costume much easier for my daughter to wear. The elastic chin strap (from the army helmet) helped keep the antennae in place on her head as she ran about! The Shell was created using three 8ft lengths of plastic landscaping drainage pipes. These were coiled and tied into place using string and then bound in place with Duct tape, which then covered the whole structure. The Duct tape allowed the ridges on the piping to show through a little adding to the ridge effect seen on real snail shells that we were trying to recreate. Then we drilled holes in the shell to allow 2 lengths of heavy duty ribbon to be tied on each side. These would become the backpack straps that she used to wear the shell. The ribbon backpack straps were covered in some more of the quilting batting and covered with the last of the cape fabric which was sewn into place so that the straps would blend with the snail body when the shell was worn. The duct tape was covered with a layer of brown tissue paper and Mod Podge, a 6ft length of mini fairy lights was hot glued into the dips in the coils of each side of the shell (the battery packs for the lights were mounted inside the pipes of the shell and accessible to switch on and off before wearing the shell) lastly my daughter used acrylic paint to add detail to the shell and when dry we covered it with a layer of varnish. She loved loved being “one of her snail family”. Her costume was surprisingly light and comfortable to wear. She found it easy to transition between Slug and Snail, taking the shell on and off, without any help from others. 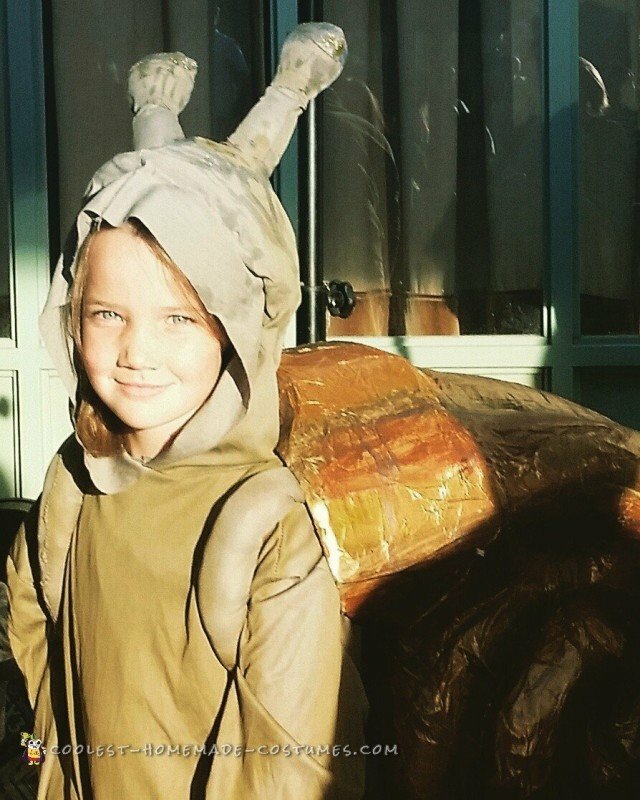 The Snail was the winner of the “most original costume” at the Elementary School. She also won “best costume”” at a dinner dance held at a local restaurant. 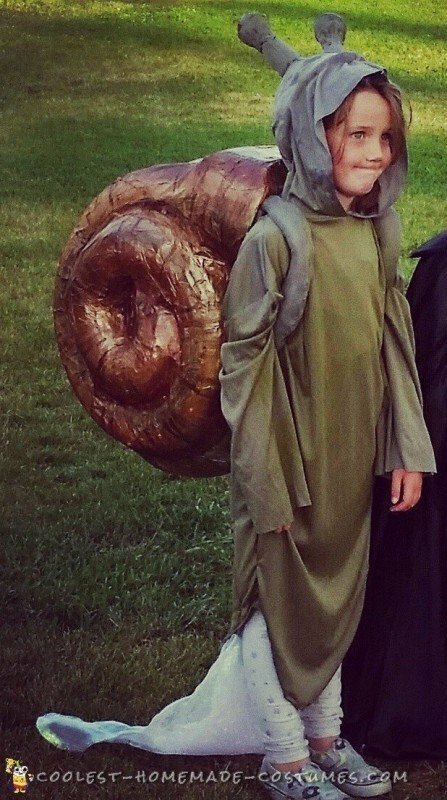 Funnily, my favorite thing about the snail Halloween costume was how many fellow trick or treating parents commented how easily it was to spot. 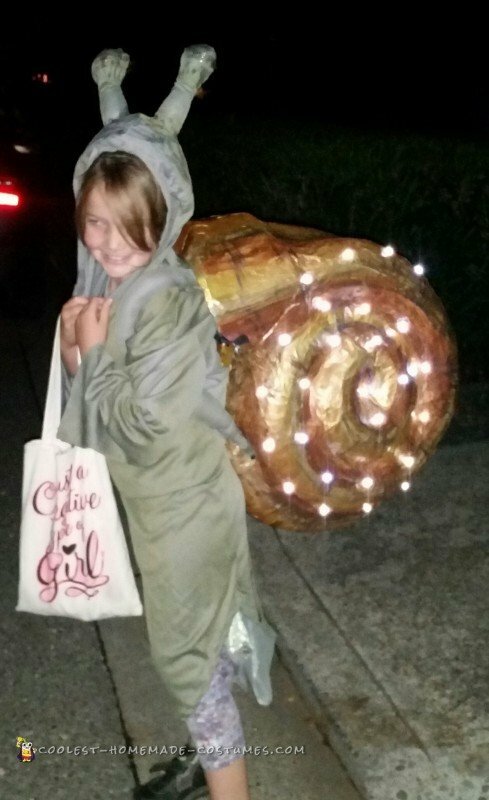 Our streets have no street lamps but the snail shell lit up the paths and driveways as the kids cruised the streets in the quest for endless candy!